Because the backside of the houses on the Place d'Armes, the main plaza in the village, bordered the route Maigret and his companions took to look at the country houses on the harbor side, it can be thought that this plaza, coming from the harbor, stretches westwards, with on the left, on the highest point of the plaza, the church. Next to the church, on the left side of it is the post office. 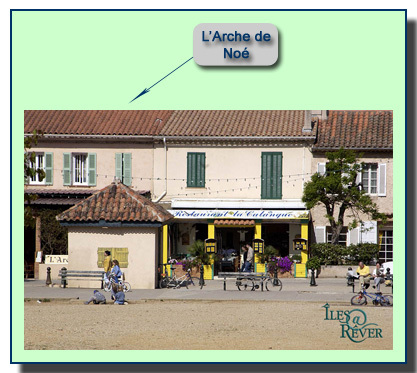 Opposite to the church, with the back to the harbor is the Auberge l'Arche de Noë. The plaza of the village at Porquerolles, for the greater part, still looks as described in 1949. The church of Porquerolles, viewed from the window of Maigret's (Simenon's) room in the inn. On the left of the church: the Post office. Chapter VII - "L'après midi de la postière"
An afternoon at the post office. "Maigret discovered a whole new side of Porquerolles that aftenoon. Still accompanied by Mr.Pyke, he had crossed the square... to go to the postoffice. 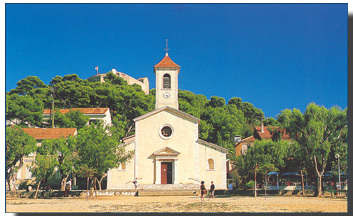 For most of its history Porquerolles was a military base. In 1850 the families of the military were encouraged to come and live on the island. Therefore very interesting leases of building sites were offered on condition that the houses to be built on that land were low and had a tree in front. That's how the Place d'Armes, with its present-day appearance and the many eucalyptus-trees originated. All sites around the plaza are only some ten meters apart. The plaza was vast and empty, bordered by eucalyptus trees, colorful houses, with, on the highest point, the small church, yellow with a white bell-tower. 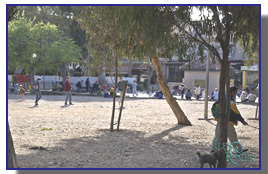 One could see several "cafés"  with shaded terraces. 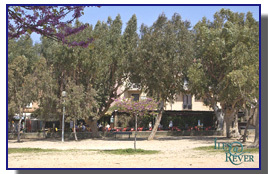 The inn l'Arche-de-Noë still exists and is one of about ten small hotels on the island. In Mon ami Maigret the Inn's owner is called Monsieur Paul, in Sous peine de mort he is called Monsieur Maurice. Indeed it was Maurice Bourges who was the proprietor of L'Arche in Simenons time. In fact a lot of the characters of the locals in the novel are inspired on authentic persons who lived on the island.
" L'Arche consisted of two rooms: in one room the bar and another, smaller room, with tables covered by tablecloths with red squares..."
- Do you like the Mediterranean cuisine, mister Pyke? - I'm not familiar with it. - Would you like to try? The present-day owners of l'Arche de Noë, Chantal and Jean Paul Morand, have restored the inn in its original state, as much as possible. 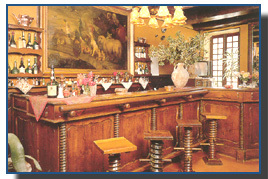 The bar on the photo as well as the barstools and the paintings are the same as in Simenon's time and so the same as described in the novel. 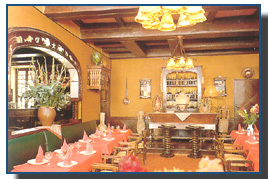 They also still serve the same Mediterranean dishes as Maurice Bourges did in that period. It is even possible to stay in Maigret's room at the inn. I want to thank Mrs. and Mr. Morand for their greatly appreciated help in searching for the right documentation to compile these pages. Something the "Bureau d'Information" of Porquerolles was apparently not able to. This story is set on an isolated island with a very limited population, a narrative technique to a great extent used by writers of detective stories before Simenon. But again in this novel the author succeeds in bringing the locality to life. The portrayal of the island, the harbor, the village, the plaza with its inn, the typical characters absorbed in the atmosphere and the ambiance of these settings, is strikingly vivid and vibrant. - Postcard Ile de Porquerolles by: Editions S.M.D. CIM - Impressions Combier, 83120 Sainte-Maxime. - Photo l'Arche de Noë: By Jean-Louis Fourtanier: Iles @ Rêver - Jean Louis Fourtanier. - Original logo of the Auberge l'Arche de Noë. - Photos of the interior of l'Arche de Noë, from the inn's businesscard. (9) Mairie (Fr. ): municipal hall, town-hall, parish-hall. (10) Café (Fr. ): "Cafés" in France are like "Pub's" in the United Kingdom and "bar's" in the US. Although the name makes assume otherwise, they mainly serve alcoholic beverages. (11) Georges Simenon, Mon ami Maigret, 1949. Excerpt translated in English by G. de Croock out of: Georges Simenon, Oeuvres complètes XIV, Editions Rencontre, Lausanne, 1968. (12) George Simenon, Justice, Included with the novel Chit of a girl, Routledge Kegan Paul, 1949 and in Girl in Waiting, Pan, 1957 and Hardcourt, USA, 1985. Georges Simenon, Sous peine the mort (Fr.) On penalty of death. This is one of the stories in "Maigret et les petit cochons sans queue," (Maigret and the Little Tailless Pigs). Assumed not to be translated in English. (13) Bouillabaisse (Fr. ): A French fish soup/stew made in the Mediterranean region, with saffron added. The authentic bouillabaisse can only be made there, because certain of the fishes do not exist elsewhere.